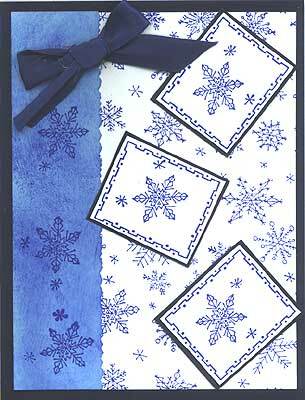 “Snowflake Background” is stamped with an Ultramarine Blue Vivid dye pad on Bristol white card stock which is glued to dark blue card stock. A narrow (1 1/4″) piece of light blue card stock with one edge cut with deckle scissors is sponged with the Vivid dye ink, repeat stamped three times with a single snowflake taken from the background stamp and glued on the left side of the dark blue card stock. Three snowflakes are inked with a marker and stamped inside “Southwest Frame, Sm.” The frame is trimmed and layered over dark blue card stock and glued to the card as though snowflakes were falling. A dark blue bow is added at the top left corner. Card by Judy Conklin and Margaret Wiggin. Previous post: Christmas Card Using Tall Fir, Lg.